I know so many people are looking for a way to make some extra money for Christmas. It’s a big expense! Every year it seems like we are buying more and more and add new people to our list. There are certainly many ways to save on your purchases, but today we are going to discuss actually making more money that you can use to buy all those gifts. Sell your stuff to Amazon: Amazon has a pretty sweet trade-in program wherein you can sell them some of the stuff you don’t want or need anymore. Things like cell phones, electronics, books, video games, and more. Cut out a bad habit. You’ll realize quickly just how much you can save if cut something simple out. For me, I am always grabbing tea the gas station. By cutting out that almost daily habit of $1.39 – in 3 months I can save almost $85! Learn To Be A VA: This is one of my most favorite ways for women to earn good money at home with no experience, just some hustle and this step-by-step training. PayLoadz: Sell all sorts of downloads you create, like PDFs, documents, photos, ebooks. You’ll be surprised at the things you can make & sell here. Selling Lipstick: Ok, you might think I’m nuts for this, but you’re going to want to check this out! Women that I know personally are making thousands of dollars each month with this! Swagbucks: You aren’t going to make a living on this site. But, you can generate a few extra bucks which you can use for gift cards, etc. This is a site LOTS of people have reviewed, so you can feel good about signing up. DoorDasher: DoorDash will pay you to deliver food & other items from local merchants to customers. Make up to $25 an hour, and keep 100% of the tips. Write an article. The website PennyHoarder.com pays $75 per article they accept. Do a craft or make a recipe. The website CraftyMorning.com will pay $10-20 per craft or recipe you create and she accepts. Fun! Sell your creations on Etsy. Does everyone love your holiday wreaths you make each year? Or your homemade jewelry? Now is the time to sell them on Etsy! It’s pretty easy, too. The Ibotta app. This free app will get you cash back on all your grocery store purchases. Sign up and get $10 to start. The $5 Rule. This is something I started doing to save for my kids but it works great for Christmas. Every time you get a $5 (from change, etc.) put it away. You’ll be surprised at how fast it adds up and how little you notice putting $5 away. Donate plasma. The thing about this, is this is the only way to earn money for Christmas that is absolutely helping people. You can make up to $50 for each donation. Here is a good article about this. Get this app. I haven’t personally tried this, but I’ve read that if you are over the age of 45 Nielson panel will give you $50 just for keeping this on your phone. Pretty easy! Ebates. If you haven’t already signed up for Ebates yet, you’ve got to do it! When you buy things online you’ll get money back automatically. It’s so simple and you’ll get checks in the mail quick. Enter Giveaways. I give away cash on this blog all the time. Here is one for $100 going on right now. If you go to BlogHer.com it will show you tons of bloggers giving away $100 Visa Gift Cards all the time. Sell your things on Facebook. There are so many local buy, trade and sell groups on Facebook that are local to your area. Instead of having a big, traditional garage sale, sell individual items on Facebook. Here is a good article with tips. Work on Amazon mTurk. They post little jobs that require a computer that pay a few dollars each. They don’t take a ton of time and it’s super easy. Sell your old electronics. Have an old iPod or smartphone laying around that you aren’t sure what to to do with? Sell it on Gazelle. 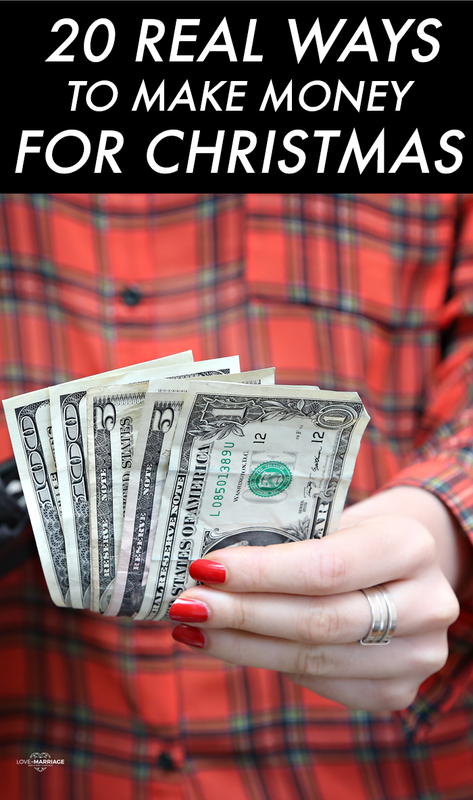 This is for Christmas, but you can use any of these ideas throughout the year for extra money!